Paul Dottino excited about calling a NEC football game? No surprise there. The Ball of Energy that is Dottino will be on the call come noontime Saturday at Sacred Heart, and former Cal quarterback Steve Levy will join him to provide color commentary. The game will air live on Fox College Sports – Atlantic, Cox (CT), and ESPN3. And for your information, the Dottino tweet above was sent in response to a complimentary tweet from Levy. Apparently, enjoyed watching Dottino and Roman Oben break down the New York Giants’ Wednesday press conference on MSG+ last night. Feigl’s tweet is what one could call a level-headed take on the NFL’s Replacement Ref mess. Unfortunately for Roger Goodell and the NFL owners, there aren’t too many fans out there who are as calm and collected as Feigl. If you’re reading this blog, chances are you’ve seen the NCAA-produced Public Service Announcement that states “There are over 400,000 NCAA student-athletes, and most of us will go pro in something other than sports.” Well, Ottaiano, who played the 2010 football season at Monmouth, actually had a few cups of coffee in NFL training camps with the New York Jets and Minnesota Vikings, but now he’s going pro in something other than sports. And the real NFL refs are coming back! News broke early Thursday morning that the NFL and NFLRA agreed to a new deal and the referees would be returning to work immediately. Shortly thereafter, the news came out that Gene Steratore will be the head referee for the Thursday night’s game between Baltimore and Cleveland. And yes, that is the same Gene Steratore who you may have seen running up and down the NEC hardwood. Steratore has officiated Division I college hoops games for quite some time and has done his share of Northeast Conference contests. Good ref, good official, and an even better guy. This former Wagner standout signed as an undrafted free agent and worked his way onto the Jacksonville Jaguars’ 53-man roster. Although he is a rookie, his tweeting suggests, he has the outlook of a veteran. Never get too high after a win, or too low after a loss. After making three tackles in the Jaguars’ Week 3 win at Indianapolis, Stanford is looking ahead, not back. Albany appears to be as good as advertised, but the Danes’ road to a repeat has some serious obstacles ahead. While the NEC preseason favorite great Danes were busy putting together a 10-point road win at No. 23 Maine, their third impressive non-conference showing, Monmouth and Duquesne were extending their win streaks to three games. If playing the No. 4 team in the country (Youngstown State) to a one-possession game on the road was evidence, then Saturday’s wire-to-wire road triumph over a nationally-ranked opponent is confirmation that Albany is playing really good football right now. There’s also the Danes’ runaway win over Patriot League member Colgate on Opening Day and a victorious showing at Robert Morris in their NEC lid-lifter. Albany has been successful in all phases of the game thus far this season and has more than lived up to its NEC preseason favorite moniker over the season’s first month. The Great Danes are doing great things, but that does not mean that other NEC teams aren’t sitting idly by in an awestruck state. Monmouth and Duquesne have both bounced back from Week 1 losses by winning three in a row. The former has a 41-6 thumping of CAA member Rhode Island to its credit to go along with double-digit conference wins over Wagner and Sacred Heart. The latter handily defeated Pioneer League foes in back-to-back weeks before opening its league slate with a road win at Bryant. Not to mention, there are six other teams in the league who suit up every week and thirst for a title just like everyone else. Plus, there hasn’t even been a full weekend of NEC play yet. Now we know what this local news anchor wishes she was doing this past Saturday night. UAlbany certainly did its faithful proud by handling No. 23 Maine on the road. Among the notable happenings that Layton missed out on are: another 100-yard rushing day for Drew Smith, a perfect performance from kicker Sean Kenny (3-for-3 FG, 3-for-3 PAT), and Ryan Kirchner moving into second place on the program’s all-time receptions list. Guess who’s back? That would be Dorian Bell. Playing back home in his native western Pennsylvania (and playing quite well), the former Ohio State transfer sent out this tweet following his contributions to Duquesne’s 35-21 NEC road win over Bryant. Things would only get better for Bell as he nabbed the coveted NEC Defensive Player of the Week award two days later. Mescall must have had a hunch that the Seahawks would play extraordinarily on special teams during Saturday night’s primetime TV affair at Central Connecticut. Shortly after the Wagner fan posed the question to the NEC-TV booth via Twitter, Wagner unleashed a night-long special teams clinic. From David Lopez’s 51-yard bomb of a field goal through the rain to Otis Wright’s 40-yard average on kickoff returns, Wagner rode its special team to a 31-13 victory. A factual Tweet from Tony G makes our list for a second straight week. The Jersey Shore sports –writing legend is still going at it after four decades and continues to provide impeccable coverage of Monmouth/NEC football. Every Week, the Overtime! Blog staff convenes and awards three game balls for outstanding effort and achievement. The Week 4 edition has taken on a special special teams theme. Unless you’re an oversized running back who routinely receives goal line carries (See: Mike Alstott), you don’t get much love if you’re a fullback. You take just as many hits as the man you’re blocking for, but he gets the carries and you get the bruises. Here at the Overtime! Blog, however, we empathize with the inglorious life of the men who play this position and want to show our appreciation fullbacks everywhere by handing a Week 4 game ball to Monmouth’s Justin Pandorf. And anyone who saw Monmouth win over Sacred Heart at the Jersey Shore this past weekend will tell you he deserves it. The 5-foot-11, 245-pound senior caught a second-quarter pass for a 19-yard gain and would later help the Hawks executes some special teams trickery. On a 4th-and-2 from the Monmouth 40-yard line early in the fourth quarter, Pandorf scampered 32 yards on a fake punt play to set up an eventual Eric Spillane field goal. The highest scoring kicker in program history (Herb Glass) graduated last spring, but the Danes didn’t miss him when they were on the road at No. 23 Maine. That’s because senior placekicker Sean Kenny has stepped up to fill the void left behind by Glass. Kenny connected on all three of his field goal attempts, accounting for the first nine points of the Danes’ 30-20 victory. Kicking on the road in a hostile environment against a marquee opponent can’t be easy, but Kenny made it look elementary on Saturday night. The Twitter bit above began to explain just how good the Seahawks were on specials this past Saturday night. In addition to Lopez’s placekicking prowess and Wright’s electrifying returns, AJ Firestone was extremely effective punting the ball in a very limited sample. And it doesn’t stop there. Special Teams coach Ryan Fullen had plenty to smile about. 99 Years in the Making: Saint Francis (PA) and Duquesne will put their 1-0 Northeast Conference records on the line in Pittsburgh this week in what will be the next chapter in a long-running rivalry that predates the NEC. Duquesne and Saint Francis (PA) first met in 1913. To put it in perspective, the Dukes and Red Flash opposed each other on the gridiron 78 years before the NEC was founded as a basketball-only conference known as ECAC Metro. In fact, the US Congress was still a few months away from passing the Federal Reserve Act (Here’s the Wikipedia Link for those of our readers who slept through their high school US history class) when Duquesne and Saint Francis first met. Regardless, 99 years later, Duquesne and Saint Francis (PA) will meet again and one of the two will fall from the ranks of NEC unbeatens. Contenders Clash in New York’s Capital: If it is even possible for a game to have a “championship feel” in the last week of September, it would be Saturday’s Week 5 matchup between defending NEC champion Albany and bullish Monmouth. Of course, the winner of the Northeast Conference title has NEVER been decided on the first full weekend of league play, nor will it ever. There is, however, no denying the fact that both Albany and Monmouth have title aspirations and both have been playing championship-caliber football over the season’s first four weeks. Both teams are undefeated in NEC play and have posted notable non-league wins over CAA opponents. The result of this heavyweight bout won’t immediately disqualify either side from winning the conference crown, but it will undoubtedly shape a title race that’s in its infancy. Remember, losses in September count just as much as losses in Week 12, and with the competitiveness of NEC football being what it is, one abnormal bounce of the ball in Week 5 can be all that keeps a team from achieving its championship dream. Tweet Your Way onto TV: NEC football will be back on the tube this Saturday and NEC-TV personalities Paul Dottino and Steve Levy will once again be addressing your Tweets. When Sacred Heart hosts Central Connecticut live (12:00 pm kickoff) on Fox College Sports and ESPN3, fans will have the opportunity to “Tweet the Booth.” Any questions or comments concerning anything related to NEC football can be tweeted @NECfootball using the #NECFB hashtag. 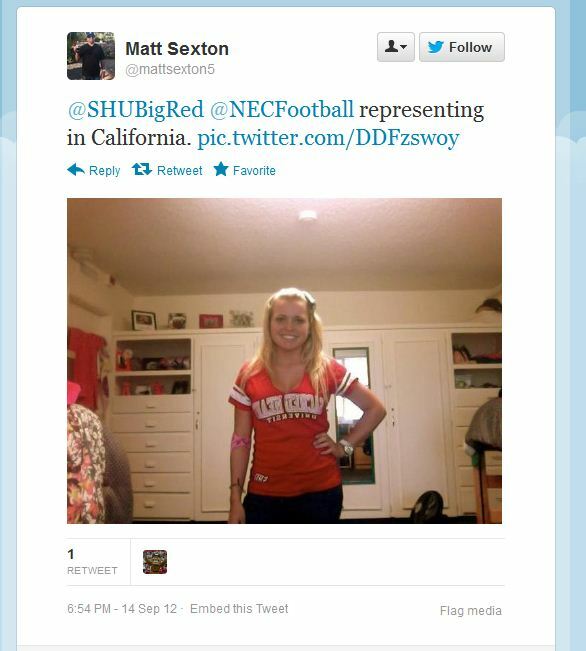 Any Tweet on Sept. 29 with the hashtag #NECFB may make it onto the live television broadcast. The red-hot Hawks are becoming a hot ticket at the Jersey Shore. @GumpHutch and whoever else is on hand at Kessler Field this Saturday (Sept. 22) will have the chance to see the NEC’s top-ranked scoring defense. Monmouth has held opponents to an average of 16.7 points over its first three games. By the looks of this inspirational tweet from Wagner’s new basketball coach Lisa Cermignano, one can expect the Seahawks to play with plenty of “passion” this season as they chase their championship dream. If this isn’t evidence that Ramsaier is fired up for her freshman year on the college softball diamond, then what is? There is one catch though – Saint Francis’ softball season actually starts in the Winter and not the Spring. The Red Flash open up on February 22, 2013 at the North Carolina A&T Tournament in Greensboro. Well, @NEChoopsRon is at it again. Teasing his followers to no end. We will be waiting to see if this “cool news” is good news. Back-to-back NEC Rookie of the Week awards appeared to have only increased this freshman’s desire for success. His level-headed, work-oriented philosophy has been serving him well thus far to the tune of 190 yards and two touchdowns in the last two games, both of which were Red Flash wins. The Northeast Conference kicks off its football television schedule on Saturday, September 22, and that means YOU will have the opportunity to fire questions and comments at NEC-TV personalities Paul Dottino and Steve Levy. Dottino (play-by-play) and Levy (color commentary) will call all of the action live from New Britain where Central Connecticut will host Wagner beginning at 7:00 pm. At numerous junctures during the broadcast, the NEC broadcast team will take a look at Twitter and share some of the best NEC football-related Tweets live on air. They will also answer fan questions that were submitted via Twitter. The topic of your question/comment doesn’t necessarily have to be about the two teams playing this Saturday night. Paul and Steve will be there to address questions about any of the nine NEC football teams, all of whom you will see on television at some point this season. 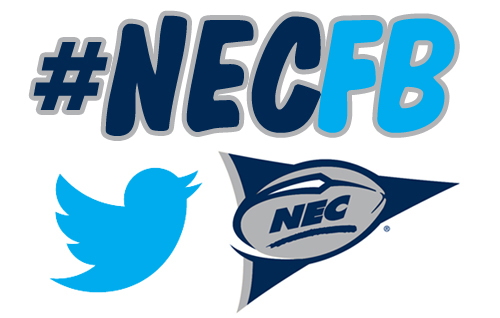 So, don’t waste any time and start tweeting your questions and comments @NECfootball today, using the #NECFB hashtag. The top tweets will make their way onto Saturday’s broadcast, which can be seen live on MSG+ and Fox College Sports (FCS). Facing their Outer Bridge rival on Grymes Hill, only a ferry ride away from the financial center of the world, Monmouth watched its stock continue to rise. The Hawks opened their NEC schedule with a bang, posting a wire-to-wire win over a longtime foe that they hadn’t beaten since 2008. While Monmouth was busy grounding the Seahawks in the lone conference game of the Week 3 slate, NEC preseason favorite Albany was giving a little more than a scare to the No. 5 team in the Nation, a team that handled ACC-bound Pittsburgh two weeks prior. After opening with back-to-back victories over Patriot League member Colgate and NEC foe Robert Morris, Albany launched an upset bid at Youngstown State that ultimately came up seven points short. The Great Danes scored the first touchdown of a game that went on to see three ties. Both Monmouth and Albany head into Week 4 at 2-1 with each team’s lone loss coming to a Top 25 opponent (both teams were within three points in the fourth quarter of those games). Monmouth lost at two-time defending Patriot League champ Lehigh, the No. 16 team in The Sports Network Top 25 at the time, by a 27-17 margin. Keep in mind Lehigh scored the game’s final points on a defensive touchdown with 00:00 remaining on the clock. You can also throw Duquesne in the mix of teams who are 2-1 with the loss coming to a high-powered opponent. The Dukes faced No. 6 Old Dominion, which is headed to FBS Conference USA next year, in Week 1. They bounced back to post wins over Pioneer League members in Weeks 2 and 3 and will open the league slate with a Week 4 date at Bryant. Not sure if Mr. Stump was at the game, but we were and can tell you that his assessment is right on. She’s fired up, and can you blame her?!?! Her team put 57 on the scoreboard! Once a Seahawk, Always a Seahawk. 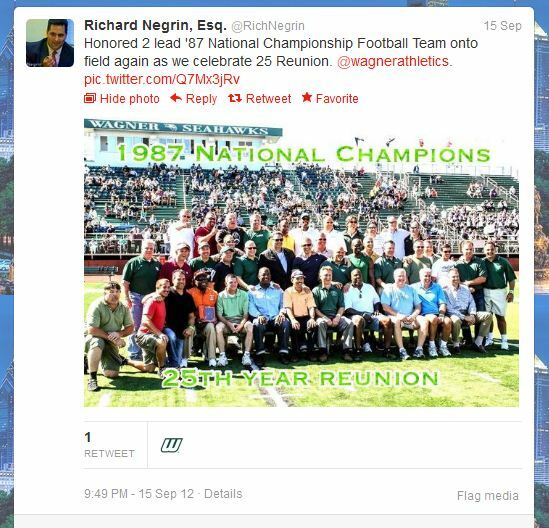 Congratulations to the Wagner Football Family on this Silver Anniversary of the 1987 National Championship. Pioneer Pride extends far beyond the borders of Connecticut. Tony Graham presents the facts. Every Week, the Overtime! Blog staff convenes and awards three game balls for outstanding effort and achievement. Senior running back Keion Wade shared the NEC Offensive Player of the Week award and freshman ball carrier Khairi Dickson kept the NEC Rookie of the Week award for a second straight week. Such individual honors can be expected when a team’s ball carriers combine for 457 yards in a winning effort, but let’s not forget about the five men in the trenches. No one has seem to notice the fact that the Red Flash lost all-NEC running back and it’s not just because the Flash’s abundance of capable backups. Much of the credit for Saint Francis’ success running the football belongs with Thurston Kino, Will Houston, Jake Smith, Colin Gdula, and Lloyd Hill. Although weekly awards programs may not acknowledge that truth, it is a safe bet that Saint Francis head coach Chris Villarrial does, as should anyone who spent 11 years up front in the trenches of the National Football League. One doesn’t receive The Sports Network’s National Defensive Player of the Week award for a pedestrian performance. The featured Tweet (from @Scott_Stump) above says it all. The “Danimal” looked as if he were possessed during Saturday’s Outer Bridge showdown at Wagner, playing with the ultimate energy and wreaking havoc in the Seahawks’ backfield. The junior linebacker burst past Wagner’s blockers on a number of occasions as if he were privy to the snap count. When the dust settled, Sullivan had himself 4.5 tackles for a loss (including 3.5 sacks) and Monmouth had a win in its NEC opener. Even with his team losing, it’s impossible not to give Hameline a game ball for what was truly a special day on Staten Island. As former Wagner College SID, and current Associate Commissioner of the Big East, John Paquette, said “How many coaches can say they’ve had a field named after them while they are still coaching?” To answer Paquette’s rhetorical question, not too many, but then again there aren’t many Walt Hameline’s out there. Whoever doesn’t think Hameline is a special guy, then you haven’t spoken to Staten Island Advance writer Jim Waggoner. Most writers would dread having to speak a coach only minutes after his team suffered a 38-17 defeat, but that was not the case with Waggoner on Saturday. “That’s what’s great about Walt. He could get hit with a bomb and still manage to have a sense of humor. No matter what the situation is, he’s great to talk to,” said Waggoner. Great to talk to and worthy of a Week 3 game ball – Congrats, Coach. The NEC on National TV: The first of five NEC football television broadcasts will unfold on September 22 in New Britain. Central Connecticut will host Wagner in this week’s featured game, which will kick off at 7:00 pm EST and air live on Fox College Sports (FCS) and MSG+. Both teams have had slow starts to the season, but there’s very little a conference victory can’t cure. Battle of the Backs: Bryant will host Duquesne in a NEC game that features both components of the 2012 preseason all-NEC backfield. Bryant’s Jordan Brown and Duquesne’s Larry McCoy were dubbed the league’s top-two running backs in the annual summertime survey of the NEC’s head coaches, but only one can be a winner this week. Will McCoy continue the torrid pace that has him sitting atop the NEC’s rushing leader board through three weeks of football? Will Brown, who currently ranks seventh amongst league leaders, rediscover the immense success he had in 2011 when he ran for the third-most yards (1,815) in the league’s single-season history? A Page from Monmouth’s Playbook? : Monmouth is the lone NEC team to have beaten a CAA member thus far this season, but Albany and Saint Francis (PA) will have the chance to join that list this week. Albany will visit No. 23 Maine, a team it has beaten in two of the last three meetings, while Saint Francis (PA) will travel to No. 13 Towson.